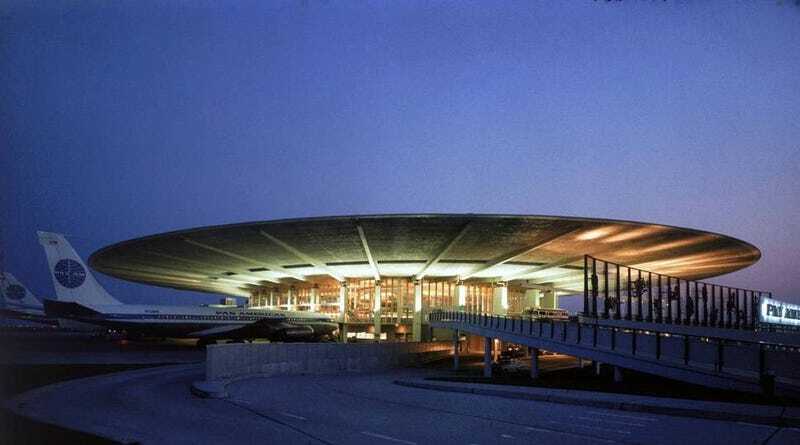 Despite some last ditch efforts to save it, the JFK airport's 1960 Googie-style Pan Am terminal is currently being destroyed. Once an important symbol of tomorrowism, this iconic Worldport™ will soon find itself a pile of retro-futuristic rubble. First opened to the public on May 24, 1960, Terminal 3 was designed by the firm Tippets-Abbett-McCarthy-Stratton and immediately became an important backdrop for this particular golden age of futurism — as much a promise of things to come as a building that existed in the here and now. The terminal was used in print advertisements to evoke a feeling of Jet Age romanticism, even for products that were firmly planted on the ground. This 1962 ad from Chevrolet promised pedal pushers of the original Jetsons era that driving an Impala was something akin to flying in a jet. Advertisers selling a diverse array of products — from pens to refrigerators to cosmetics — were all clamoring to associate themselves with techno-utopian, leisure society thinking. This car wouldn't just give you a smooth ride, it was "jet-smooth." Worldport™, despite being a symbol of the future, would prove ill-suited for our modern world. The terminal's circular design didn't lend itself to the jetways that would emerge in the decades after its birth. And as far as our evolving national security apparatus was concerned, its design was a tiny square hole for the TSA's enormous circular peg. The terminal was officially closed on May 24, 2013 (exactly 53 years after it first opened) and is now being taken apart, slowly but surely. Some estimates say that it won't be completely gone until 2015. So if you find yourself flying through JFK in the next year, take a gander at the old Terminal 3 — a ghost of futures past.